Starting a compost bin is one of the best things you can do for the environment. 25% of everything Americans throw out is compostable, and 16% of methane emissions are from organics unable to decompose in landfills. Starting a backyard compost is easy. Even if you're bad at composting, it's better than not composting at all. Get my ultimate guide for starting a backyard compost. If you aren't up for the task see if you can bring it to a farmer at your farmers market, a community garden, or even a local composting service. 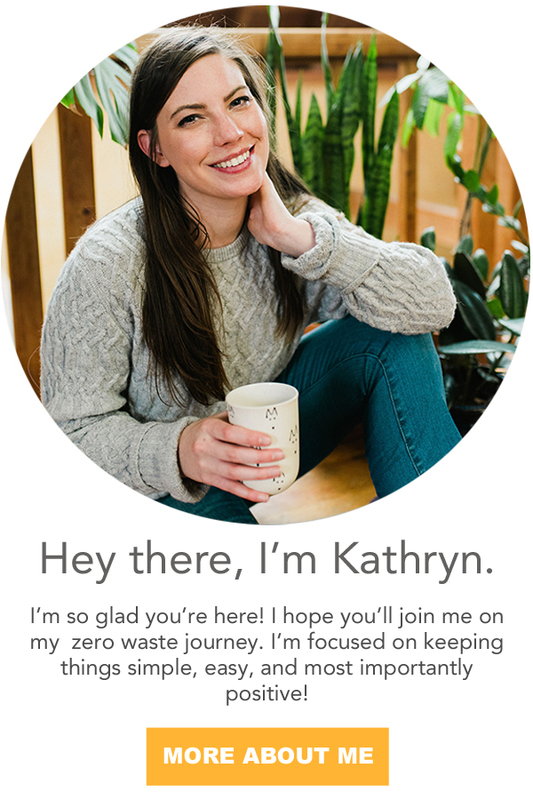 Composting service typically doesn't cost more than $20 a month. Reusable bags are for more than just groceries! Use them for all of your purchases from the pet store to the home improvement store. Before you leave your house, ask yourself if you'll need a reusable bag*. If you're on foot, look for a small foldable bag you can keep in your pocket* or on your keychain*. If you'll be driving, train yourself to keep your bags in your trunk. Get in the habit of putting them back in the trunk right after unloading them in the house that way no matter where you are - you'll always be prepared. Seriously. You don't want it. The trees don't want it. Nobody wants it. You can call places to stop it, use this website, or put a handy little sticker on your mailbox. It's been the perfect thing to stop junk for me. Paper towels, tissues etc. Paper towels can be replaced with rags. Tissues can be replaced with handkerchiefs. 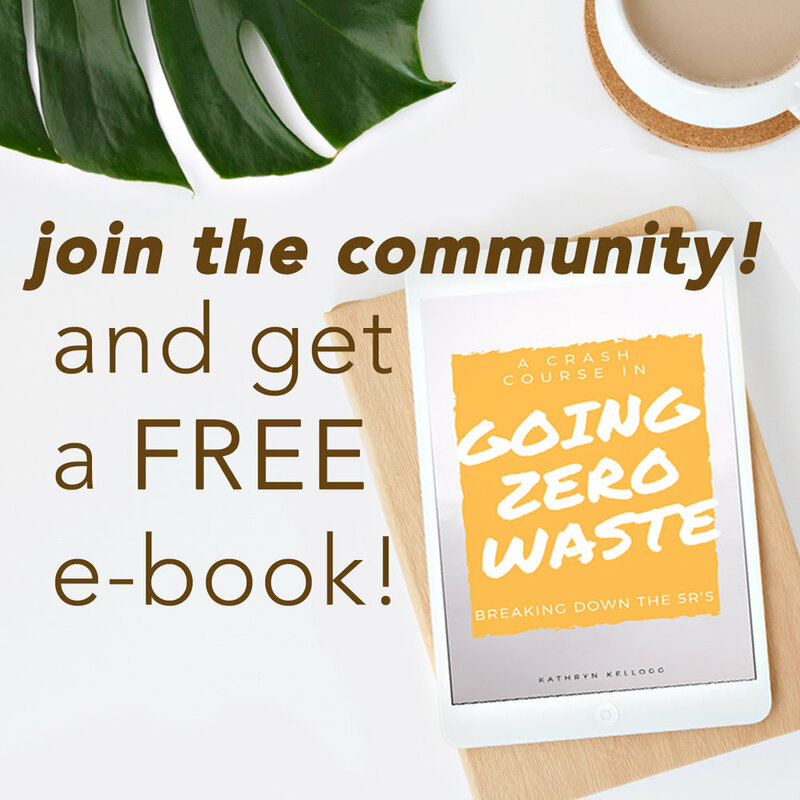 Get my top 10 list of zero waste swaps here. And, make better choices when it comes to toilet paper. I love my bidet attachment. It doesn't eliminate toilet paper, but it has reduced our consumption by 60%! To avoid the plastic wrapping you can buy rolls wrapped in paper, preferably unbleached*. You can find this at an office supply store or Amazon. Make your own cleaning products. I have two recipes for simple all purpose cleaners I use all over the house. For more heavy duty jobs, check out my tub scrub recipe. Or if you prefer to let a professional handle it, I can highly recommend Fillaree. There's a great refill program to keep things zero waste. Try your hand at making your own beauty products. It's so simple to make mouthwash, toothpowder, even your own lotion! Even if you don't want to DIY, you should look into switching to organic alternatives. I've struggled with my skin for a long time. I've tried Proactive, Arbonne, and Rodan+Fields, and they have all taken their toll and never resolved the problem. My skin started clearing up after I stopped using them. Now, I use a simple cleanser* and moisturize with this homemade vitamin e balm or this lotion*. I also love to make my own face masks. Check out my clay mask and green tea mask. Look for products that pull double duty. The fewer products you buy or make, the fewer ingredients you'll need and the fewer resources you'll use. You don't need something for each individual task. Why make eight different cleaners when one all-purpose cleaner will do most jobs? Why make 5 beauty products, when you can use one product for five uses? For example, I love this vitamin e balm. You can use it to moisturize the ends of your hair, body lotion, lip balm, condition wooden spoons and cutting boards, as well as a makeup remover. Quit paying a 280,000% markup for bottled water. There are so many filter options available to you. Britta pitchers, soma, attachments to your sink, and charcoal sticks. If you're really lucky, the fridge does all the work for you. Many fridges have filtration systems already set up, just don't forget to change out the filter once a year. Keep it real around the dinner table. Use cloth napkins, real plates, and real cutlery. You eat three times a day. Which means you can make a huge impact with your choices three times a day. Be a conscious consumer. Try to buy second hand. Try to buy things in the store without unnecessary packaging. Try to buy food from local farmers. Try to buy food in bulk without packaging. Try to avoid plastic. Think about the before life and the afterlife of each product you bring into your life. How did it get to you and where is it going after you're through with it. With being a little more aware or your purchases and phasing out single-use products, you'll reduce your waste by almost 80%! Upcycle your trash can into a flower pot because you won't be needing it much longer! How are you reducing your waste in the home? This post contains affiliate linking. It's denoted with an asterisk. This means if you choose to purchase one of these items I will make a slight commission for referring you. You can read more on my disclosure page.